Hello Everyone! 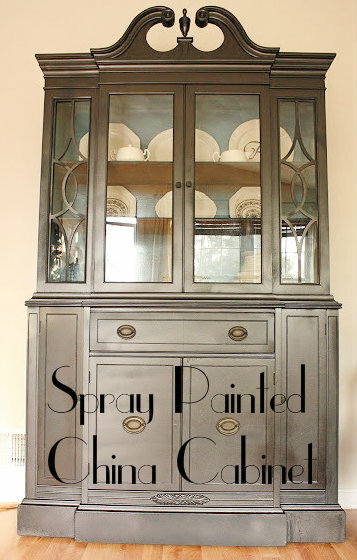 In my last post I asked for advice on painting my china cabinet in my living room. I've had this china cabinet for about a year now. I purchased it at Salvation Army for $20. At first, I wasn't too fond of it because it wasn't really my style--but isn't it funny how things grow on you and your style changes? 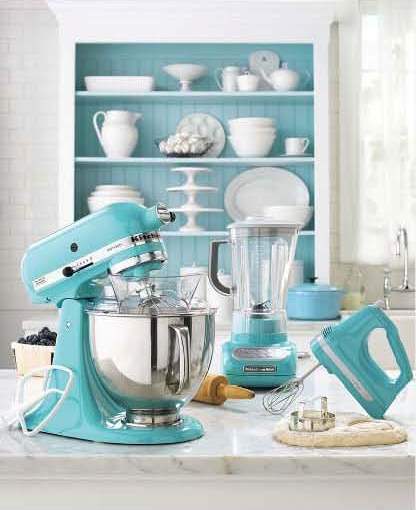 My original plan was to paint it like this beautiful cabinet--white with a blue background. Quite a few people suggested that I leave the china cabinet as is, but, unfortunately it has many imperfections---imperfections that weren't extremely visible in the pictures I had shown. YIKES! I know-it needs some serious repair! It was also suggested by Jenny @ Simcoe Street to paint it blue to match the pillows . . . While I LOVED that idea-I just don't think I'm that brave! since I had the spray paint on hand-I went with it-and so the transformation began! Off went the hardware and glass inserts. Then we went the quick route, $.99 Walmart Spray paint in flat black. I figured-if I hate it in a week or change my mind in a month or two which I tend to do quite often, I know that I didn't waste too much money or time on this makeover. I then decided to use Krylon's "Bahama Sea" blue spray paint for the back of the cabinet (because I had it on hand and figured that I might as well try to copy my inspiration photo-somehwhat ;) that was my risk taking for the day). My plate arrangement is a little random, but i just wanted to see how it would look with nice white plates and I'm loving it for now . . . I will also need to touch up the shelves from the over spray. That I'll need to do with a foam roller. Can you tell what I usually store in the bottom of this china cabinet? Yes-lots and lots of old dvd's (currently under the chair). So, what do you think? $8 and about 3 hrs later-not bad for a quick makeover. Wow, Carli! Spray painting it really made such a big difference! I love the blue background- so pretty! Looks so nice against your white plates! PS. I spray painted my daughter's bed the same way. Used the cheap Home Depot stuff as a primer then went over it with Krylon! I did start off using the Kilz primer though, but it started spitting. So I stopped using it for fear that it would leave drip marks. Do you know why it does that? I shook the can up really well. Then when I sprayed it with poly, it started turning yellow. So I had to go over it again with paint. Morning Brandi! Yes, it did! I love change-I am a little worried though that the black is a little too harsh, but I'll live with it for a little while and see-I guess that's the best part about thrifting-you can change things out without making a big investment. We've found that the odorless one spits out like that as opposed to the smelly original one-I'm not sure why . . . did you use the odorless Kilz? Also, my hubby says that you really need to shake it before each spray. What kind of poly did you use? Did you spray the bed white? That is awesome!!!!!!!!!!!! It looks like a $1500 piece from a well-known furniture store! That is a blessing that you were able to do that for that price in that amount of time!! It looks great! Smart move with the ORB top coat. I'm just seeing this post! I love it! Absolutely love the contrast in color. LOVE this and will be featuring it this week on Thrifty Thursday! Wow you got that for only $20!?!? I'm amazed. Looks like I've gotta go to Salvation Army... I need a hutch like this! Your spray painting job looks amazing as well. Amazing how a little spray paint can completely change a piece of furniture! I found your china cabinet redo through pinterest. It looks great! I love Oil Rubbed Bronze, but never would have thought to use it on furniture. I have a china cabinet I've been putting off redo-ing for over a year now. I love how you jumped in, and got yours done, and it turned out great! In your last update you asked for advice on painting your china cabinet in your living room. You did an excellent job here Carli. Please keep up the good work. Thankk you! Love this!! Did the fretwork on glass come out easily for you to paint it? I have a china cabinet I need to paint and was wondering about that part.